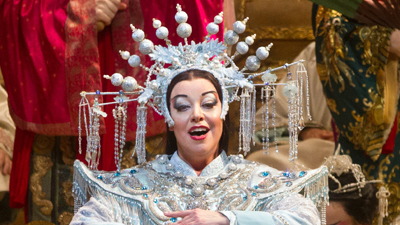 Franco Zeffirelli’s sumptuous production of Puccini’s final opera has been a Met favorite ever since its 1987 premiere run, captured in this telecast. James Levine brings out all the color and drama of the composer’s most ambitious score, leading a stellar cast: Plácido Domingo is Calàf, the unknown prince, Eva Marton sings the title role of the icy princess, Leona Mitchell is Liù, the innocent slave girl, and Paul Plishka plays Timur, Calàf’s father. 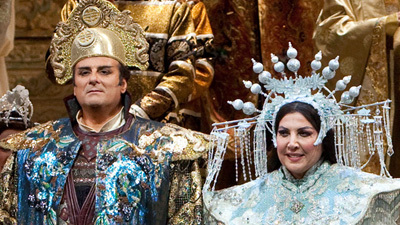 Veteran tenor Hugues Cuénod, at 85, sings the ancient Emperor Altoum, in his Met debut.